The European Nightjar (Caprimulgus europaeus) is also popularly known as the Night Hawk, Fern Owl, Churn Owl, or Jar Owl, the last names being given to it on account of its peculiar cry. There are few birds, indeed, which have received a greater variety of popular names, for, besides the Goat-sucker and the five which have already been mentioned, there are the Wheel-bird and Dor-hawk, the former of these names having been given to the bird on account of its wheeling round the trees while seeking for prey, and the latter on account of the dor-beetles on which it largely feeds. 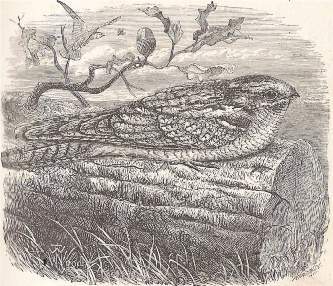 This curious variety of names is probably due to the very conspicuous character of the Nightjar, its strange, jarring, weird-like cry forcing itself on the ear of the least attentive, as it breaks the silence of night. It hardly seems like the song of a bird, but rather resembles the sound of a pallet falling on the cogs of a rapidly-working wheel. It begins in the dusk of evening, the long, jarring note being rolled out almost interminably, until the hearer wonders how the bird can have breath enough for such a prolonged sound. The hearer may hold their breath as long as they can, take a full inspiration, hold their breath afresh, and repeat this process over and over again, and yet the Nightjar continues to trill out its rapid notes without a moment's cessation for breath, the sound now rising shrill and clear, and then sinking as if the bird were far off; but never ceasing for an instant. This remarkable cry has caused some people to look upon the bird with superstitious dread. To many the bird is unknown except by its voice, as it can be difficult to spot when at rest.